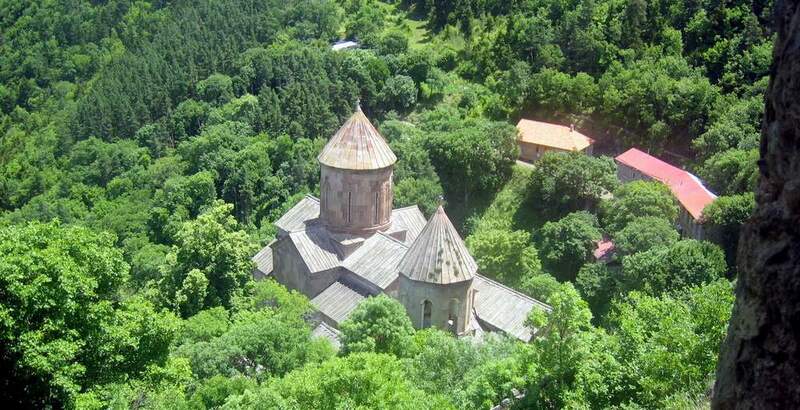 Saphara Monastery is located in Southern Georgia in a distance of some 10-12 km from the town Akhaltsikhe, deep in the gorge, away from any residential arrears, on the plot hidden by surrounding mountains. The monastery was founded in X century the latest. 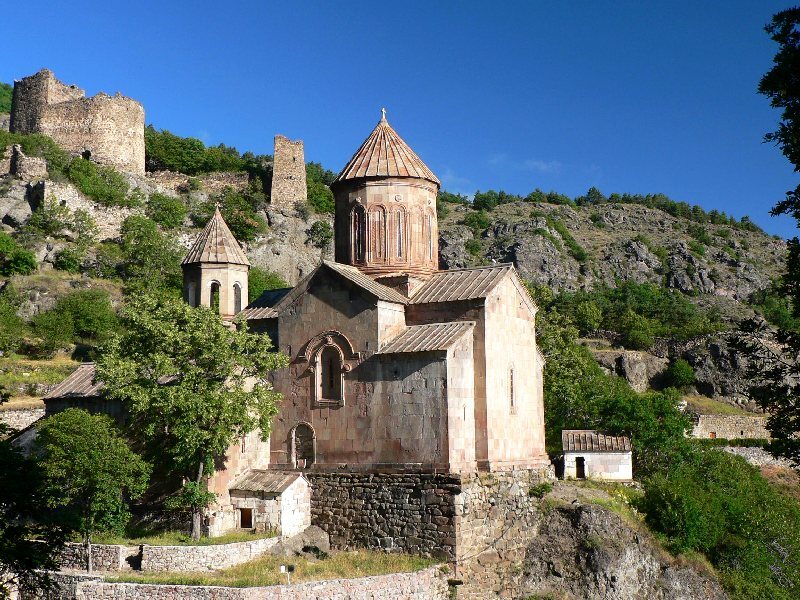 By XIII c the monastery is the possession and one of the residences of the noble house of Jakeli-owners and rulers of Samtskhe, with their ossuary arranged therein. A single-nave church of Dormition of Mother of God constructed in X century is the earliest monument of the complex that is country-famous for its iconostases richly adorned with most sophisticated rising sculptures, several fragments of which are exhibited in Sh. Amiranashvili State Museum of Art of the National Museum of Georgia. The church itself is one of the most interesting monuments of its epoch with the sanctuary built of precisely hewn stones. Sanctuary window is framed with the perfect sample of fretwork craftsmanship. The construction with an original cornice has got a simple, proportional and very expressive interior by pilasters. There is a gallery arranged in the western section of the interior. St. Sabah’s church of the end of XIII c. is the main temple of the monastery. As for the bell tower and the palace, they were constructed at the turn of XIII-XIV cc. At those times Beka Mandaturtukhutsesi (Chief of Police in medieval Georgia, something similar to the modern Minister of Interior) son of Sargis was the real ruler of the historical region of Samtske. The members of this noble family, Sargis, Beka and his two sons Sargis II and Kvarkvare are painted on the walls of St. Sabah church. Fortunately the name of the architect of this church has survived till nowadays. His name – Pharezasdze is mentioned in the inscription curved on one of the window framing slabs fixed over the western porch. St. Sabah church has got the recorded cross configuration. It is faced with neatly hewn stone slabs. Just in contrast to highly sophisticated and richly decorated architectural monuments of the end of XII-first half of the XIII centuries there are lots of empty, smooth areas on the exterior of this particular church. All proportions of the construction are relatively lowered. The seven century-long tradition of decoration of eastern facades with niches has disappeared here at once. Neither fretwork of rather good quality bears the sign of creativity and real craftsmanship of previous times. Interior of the church is adorned with almost contemporaneous although eclectic wall painting. Saphara Monastery bell tower is very close to the early Georgian bell towers. Its lower section with cube-like configuration is crowned with light construction opened with vaults. An ossuary was arranged on the ground floor, whilst the bell tower itself was set above the first level. The ossuary decorated with wall painting belonged to the noble family of Lasurisdze – Chamberlains of the House of Jakeli. All other chapels and prayer houses scattered on the territory of the monastery are also built of neatly hewn rocks. All of them were built in between XIV-XVI cc. (One of the constructions has got a rising decoration with the image of Holly Cross Elevation, that is apparently of VII c). The fortress with massive stone wall had once dominated the surrounding landscape. The monastery abandoned by the end of XVI c. was re-occupied in XIX c, when Russian monks came here and re-established recluse life. Several new buildings were erected and some of the old ones were repaired and refurbished at those times in some cases making their shape and features ugly. The monastery repeatedly abolished by the Soviets regained its old function only by the end of the 80-ies of the last century.